Considering how many sports teams the Bay Area has -- and the fact that at least one is usually playing well every year -- it’s always been surprising that SF doesn’t have more sports bars. 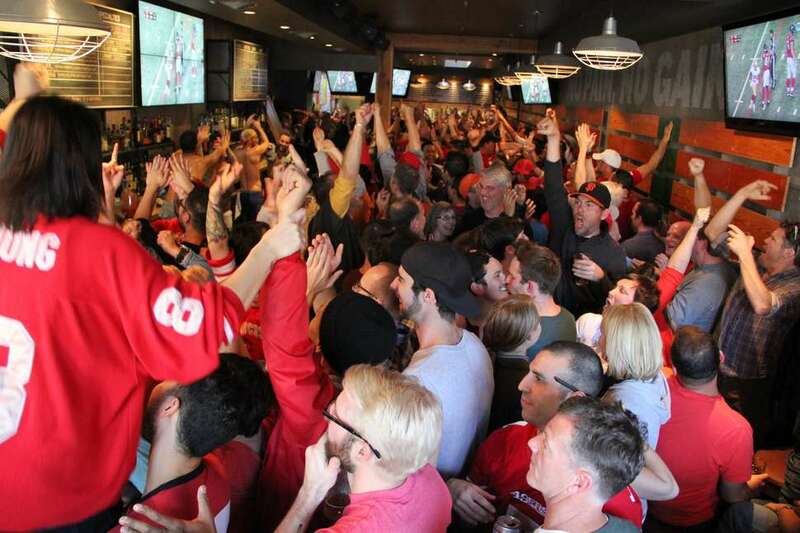 Sure, there are a bunch of bars with a couple of TVs that cater to their local neighborhood crowd, but sometimes you need walls of TVs, game sound, a full bar, good service, and plenty of rowdy fans to celebrate with. So look no further than these 11 spots, all of which we’ve watched many a game at and always had a good time… even when the Niners lose. 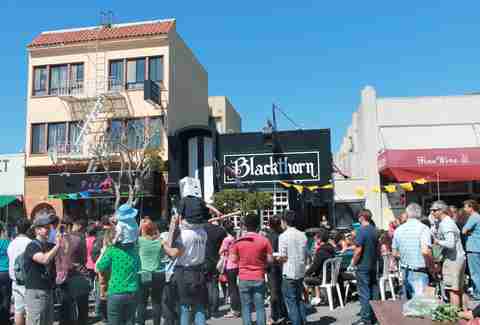 The thing that makes Blackthorn so great is that it’s just a typical sports bar, something that’s oddly hard to find in San Francisco. It’s got a chill vibe, tons of seating (including a few comfy booths), 20 HDTVs with two sound zones that show all of the NFL, MLB, MLS, and NBA games, as well as UFC and boxing pay-per-view events, an outside patio with a TV, 14 beers on draft, a full bar, trivia on Mondays, karaoke on Tuesdays, live music on Thursdays, pool tables (free during happy hour), and WiFi. There isn’t food, but Blackthorn has a book of menus in case you want to order something to be delivered (or just pop across the street and get the famous wings from San Tung). The Bus Stop has been an SF institution since 1919 and, despite the bathroom situation, is jam-packed whenever there’s a big game (and all weekend long during football season). There are 26 flat screen TVs in two rooms and the back room is also where you’ll find two pool tables. There’s a full bar, but no kitchen; however, you can bring in food… or just fill up on buckets of beer. Do you like hot dogs, sports, and beer? Then you’ll like Final Final. Final Final (named for the round you swear is the last round, but never is and never said with the official “The”) is a neighborhood sports bar that people from outside of the neighborhood frequent ‘cause of its 12 flat screens, full bar that includes 24 beers on tap, pool tables (two), dart boards (also two), photo booth (one is enough), jukebox with 250,000 songs that you can play from an app (not during an important game, obviously), U-shaped bar, free popcorn, and totally mediocre food (seriously, they have the Papa Murphy’s “Take N’ Bake” pizzas on the menu) that tastes so damn delicious after a couple of strong drinks (and they’re almost always strong drinks). This enormous space in the heart of Union Square lacks any of SF’s notorious dive bar “charm,” but what it’s lacking in allure, it makes up for with 100 beers (on tap and in bottles), a full bar, pub fare, 20 screens, two shuffleboard tables, three Skee Ball games, two foosball tables, air hockey, Big Buck Hunter, Golden Tee, old school arcade games, pool tables, and every sports package provided by DIRECTV®. First, let’s be clear: there’s nothing wrong with catering to Marina bros. And as long as your expectations are set and you’re okay with a loud, possibly rowdy crowd, then Greens is a great place to watch the game. There are 20 TVs, the walls are covered with sports memorabilia, and the service is fast (especially considering the crowds). Though there isn’t food, you can bring it in from anywhere (we suggest Nick’s Crispy Tacos, which is a block away). Hi Tops’ slogan is “Cold pitchers; Hot catchers,” which tells you a lot about what you need to know about this bar, but not everything. Here’s the rest of it: there are 26 flat screen TVs, attentive bartenders, shuffleboard, and good food (especially for a sports bar). The fried chicken sandwich or house-made corn dog are the way to go, and, best of all: they have It’s-Its for dessert. 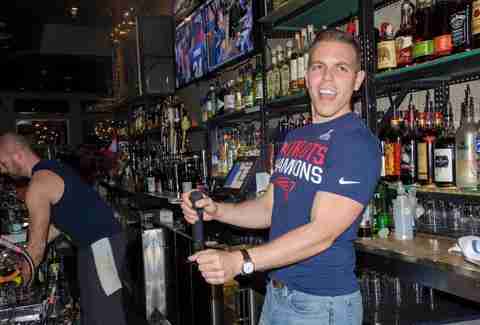 The bar gets crowded during games, but also for people who hit it up on Tuesday for trivia and Thursdays for whiskey shots and go-go boys. There are two Kezar bars within blocks of each other, but if you’re trying to watch the game, this pub across from Kezar Stadium (not the “bar and restaurant” in Cole Valley) is the one you want. That’s due to the fact there are 20 TVs in two different rooms, 20 beers on tap (which you can get by the pitcher), a full bar, “world famous” wings that are certainly not world famous, but are definitely tasty (as are the Irish nachos if you’re into pub fries with nacho toppings), a full breakfast menu on the weekends, AND because it’s open for every single soccer game, no matter the hour. In fact, the only thing that makes Kezar Pub not our favorite place on earth is the Eagles fans who sing “Fly, Eagles, Fly” after every touchdown. It’s enough to drive a person to drink. Luckily, you’re in the right spot for that. 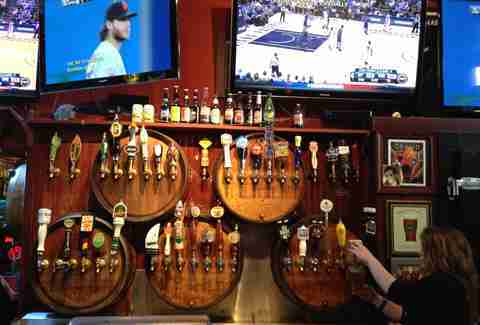 Most bars in SF (especially sports bars) are cramped... so walking into Pete’s Tavern (across the street from AT&T Park) feels like walking into somewhere you’d find in suburbia. But since that means towering ceilings and ample seating (though it still gets crowded, so get there early for a big game if you want to sit), that’s a good thing. Pete’s has a full bar and an extensive menu with all of the things you want to eat while you watch sports: mini corn dogs, nachos, sliders, wings, pizza, and burgers. Head upstairs for a more intimate vibe and be sure to check out the photos of sports legends on the walls when you go to the bathroom. Saying a sports bar is the city’s best sports bar is certain to piss some people off who swear by wherever they love to watch the game, and while we get why certain watering holes are near and dear to people’s hearts, there’s just no argument that a place with six TVs is better than a bar with 28 HD screens (including two 80-inch screens), nine sound zones, and bathtubs of beer. SFAC also has booths with personal sound systems that seat 8-14 people (and can be reserved), a full bar, and extensive menu with all of your favorite bar food dishes (including five kinds of hot dogs), and a pool table and shuffleboard for when your game is too painful to keep watching. This Noe Valley sports bar is all about the state: 17 HDTVs, 40 beers on top, three-level outdoor beer garden with heaters, 6 outdoor TVs, one pool table, and lots of friendly bartenders. The only bummer is they don’t serve food, but you’re allowed to bring it in -- and Paxti’s Pizza (Chicago-style) is right next door, so maybe that’s not actually a bummer at all. Yancy’s feels like a basement rec room from another era where everyone went to hang out after school and on the weekends. There’s tons of kitschy décor/clutter, the upholstery on the couches and booths has probably never been cleaned (same goes for the carpet), and you get the sense that you should probably take a shower before you go to bed. 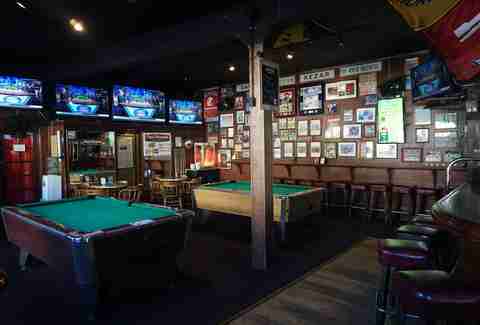 But there are also 14 TVs, five of which are over 40 inches, three dart boards, lots of seating, and cheap drinks. No food, but you can bring it in takeout (of which there is no shortage). Just be sure to grab cash at an ATM while you’re picking it up because Yancy’s only accepts cash. Daisy Barringer is an SF-based freelance writer and a die-hard 49ers fan. Follow her on Twitter @daisy to see what a lunatic she turns into on Sundays.